La Joya’s Neighborhood Doctor – both the name of the practice and a well-earned moniker for its physician, Dr. Norma Cavazos – is a family practice that has been providing high quality care to the people of Mission, TX, for over 20 years. Dr. Cavazos, her three PAs, NP, and the rest of her staff have been using eMDs Solution Series for many years, and recently chose to move to an eMDs hosted service to keep them focused on patients, not technology. In the summer of 2016, Dennis Laughlin, Dr. Cavazos’ Practice Administrator, received a phone call from a longtime colleague. The discussion included billing operations, which got Dennis thinking. “To be honest, we were having issues with our old billing company,” says Dennis. 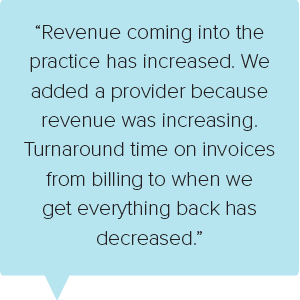 “We were noticing money left on the table.” The colleague told Dennis to get in touch with eMDs, their PM/EMR vendor, and ask about Revenue Cycle Management (RCM) services. “eMDs can add their RCM services to the Solution Series application you’re already using,” Dennis was told. “It’s worth it.” Dennis contacted eMDs immediately. After eMDs provided a free assessment of their financials, which allowed them to pinpoint exactly where they were losing money, Dennis and Dr. Cavazos decided to take the plunge. “When we looked at everything, it didn’t make sense to NOT try it.” By September of 2016, they were live. “The service has been ideal and the staff is attentive,” says Dennis. “The whole experience with RCM has been great.” The practice is in regular contact with their eMDs account manager, who reviews their financials with them every month and provides an easy point of contact for all things eMDs. La Joya has seen its most striking improvements in its Accounts Receivable. The percentage of their AR that is over 90 days old has plummeted from 87% to 23%. Almost half of their AR is under 30 days old now, where before it was a paltry 7%. And, their overall Days in AR has dropped by nearly 20 days. All of this speaks to drastic improvements in how much and how quickly La Joya gets their money in the door. Dennis adds: “Dr. Cavazos likes the turnaround time in particular. She likes knowing when we’ll get paid and how much.” Because eMDs’ RCM team works directly in the practice’s Solution Series application, Dr. Cavazos and her team have full transparency into the RCM team’s activities. On top of that, if they have any questions, they can communicate using the system.